Are you cutting your toenails correctly? Straight or curved? Long or short? Podiatrist Joseph Frenkel sets the record straight. Toenails – love them or loathe them, these curvy appendages are an important part of our feet. So one question I get asked very often as a Podiatrist is “what’s the best way to cut toenails?”. Surprisingly, the answer is simpler than you might think! But the equipment, eyesight and skill of the person cutting them makes all the difference. Often individual toenails can have their own shape, even on the one foot! So take note of the shape, size and growth patterns of your toenails before going at them with those clippers. A common toenail teaser is whether to cut them straight or curved. My approach is often to go with what feels most comfortable, provided you have the right skills and equipment. Same goes for how much of the nail to cut. 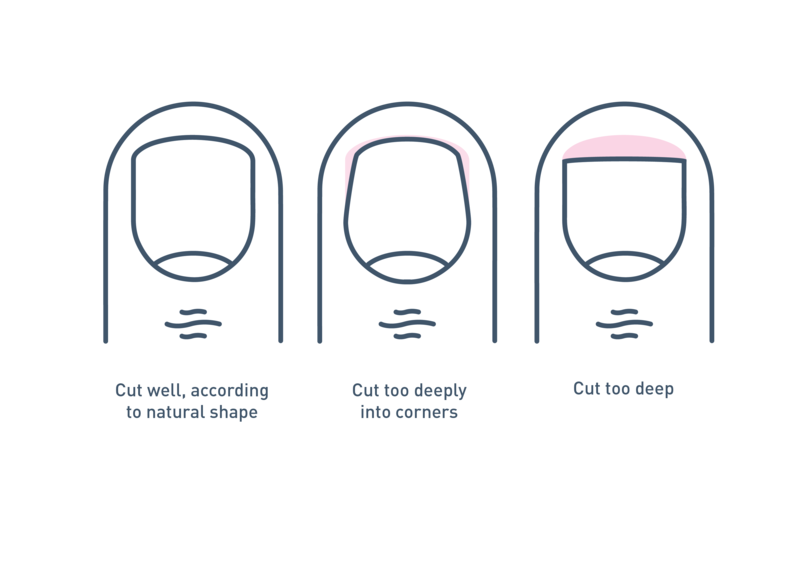 Much like fingernails, there isn’t a problem with cutting nails curved or short as long as the natural shape of the nails is kept intact, as shown on the left hand side in the diagram below. Aside from shape-shifting challenges, the equipment used for cutting your nails is often the greatest cause for concern. Scissor-type clippers are the best when it comes to cutting nails, as these offer the greatest amount of flexibility when taking into account nail shapes. Flexibility is a key word here; as many people are unable to properly reach their feet to trim their nails. Or even more concerning, they can’t see them clearly either! Knowing your limitations will save you any possible “nail-ache” as you can only fix what you can reach and see. When should you cut your toenails? Trimming nails after showering is generally better, as any dirt under the nails is washed away allowing a clear visualisation of the nail and its surrounding structures. Cleaning your nails before cutting them will also help prevent infection, as will keeping your cuticles intact since this thin membrane acts a seal against fungi and bacteria. Whatever your approach with length or curvature is, always start slowly and carefully, as you can always come back to it and trim more nail. Make sure you can reach and see the nails that you intend to cut. Take note of the shape of your nails before you cut them and cut your nails according to your preference (curved or straight, long or short) but bare in mind the surrounding anatomy. Use scissor-type clippers and clean your feet before trimming your nails. Start by trimming less to begin with and keep cuticles intact to prevent nail infections. If you have any concerns, see a podiatrist for professional advice and treatment. Wishing you all happy, healthy and toe-tally pain-free toenail clippings!